Life would be great if I could remember everything I needed to do in my head without having to consult a to-do list but that will never happen for me. When you decide to get organized with something in your life you almost feel like weight is lifted off your shoulders. I’ve made the mistake once in my life when I let work get the best of me where I then let things slip at home. My life was a bit of a chaotic mess during this time period because I was young and working as many hours as I could fit in while I could. I wasn’t a money hoarder or work-a-holic I just didn’t mind working for money and having the ability to save so I could afford holidays while paying down my mortgage faster. In the meantime I wasn’t completing all the tasks in a home I bought in my early 20’s because balance was hard for me. As a young guy I didn’t know everything. Who’s perfect after all? Nobody. Life is all about experimenting and learning from our mistakes and I did just that. My mind was so busy when I was at home that I was running around every day trying to get things done plus take care of my dog. It wasn’t until I realized that things needed to change after I forgot to lock the front door of my house before I went to work for a 12 hour shift. You might laugh and think it’s no big deal because people leave their doors open all the time. Not this guy. I don’t know if an insurance company will cover anything that is stolen in a house if any of the entrances are left open but it’s something I’d like to find out now that I live in Canada. Had someone broken into my UK house and my insurance told me to take a hike I would have potentially been out money for any theft or damage to the home. I’ve never forgotten to lock the door since but what I learned from that mistake which could have ended badly had someone found their way into my home was that I needed to make a to-do list. I also learned that I needed to take time for myself. If you have been a follower of CBB you may have noticed my passion for to-do lists and organization and now you know the secret as to why I am this way. No, “Lock your front door” was not on my to-do list but the plan was to make sure that the important things in my life were documented for me. When you can take some of the load from your mind it makes things so much easier. I can’t remember everything I need to do on a daily basis so having what I call my “Life Organizer” or the to-do list really puts life into perspective for me. Some of you may have a daily planner or monthly calendar which does gives you the same results. I went from a guy who hardly had any time to himself and easily frustrated to a guy that was in control of his life. You see, the more you have on your mind the less you think of the small things around you. You may forget to lock a door, leave your wallet in an open vehicle, forget to put your groceries in the car after you pay for them, run a red light or get distracted very easily because your mind is always on full-speed ahead. Unless you are a multi-tasker who has their life under control you should take some time to create a to-do list. I can’t say I know anyone like this. Your brain being cluttered is just as bad or comparable to having a house that is busy or full of stuff you simply don’t need. Trust me when I say a to-do list has made a world of difference to my daily schedule and I don’t make silly mistakes like forgetting to lock the front door. When do I make my to-do list? It depends really on how my days are going each week. Although I create a monthly goals list for this budget update I will use that and break it down into weekly chores for my to-do list along with other things you probably don’t care about reading. I might review an upcoming week on a Sunday evening and plan my week the best I can in my book. Yes, I write everything out in an organization chart that I pencil in my book and put a line through it when the task is completed. Some people would rather create a list on their smartphone or computer but not me unless it’s for the blog or other home related tasks like our freezer inventory, pantry list etc. As long as I can find 20 minutes a week of quiet time where I can just think about my life and what I need to accomplish I’m happy. How many of you take time for yourselves to reflect on what you need to make your life easier? If the answer is never, you should take time to evaluate your daily life and see if there are ways to improve the efficiency in which you achieve your goals. As a blogger you should be organized although when I started blogging I had no idea what an editorial calendar was and why it was important. I’m not a super-blogger but I do keep a calendar and a t0-do list is always on-going. The problem with trying to handle life like you are some sort of superhero is that when you fail at something you might put too much pressure on yourself. Failure is not an option for some where others don’t care if they do something or not. I lean more towards the ‘failure is not an option‘ but if I do then I find out why and try not to make the same mistakes twice. Give yourself the ability to plan and take some stress off your shoulders by unloading the tasks you need to accomplish where you can see them. Do you keep a to-do list or do you fly by the seat of your pants? How is that working for you? There was nothing particularly wayward that took more money than it should this month. The housing ratio is higher than normal due to the house taxes and the purchase of the long awaited new garage door opener. I declined the option of getting the garage door opener fitted for me and took the challenge on myself. The costs to have someone come out to install a garage door opener is a bit high but if you don’t know what you are doing it’s worth the expense. It took me a couple of hours one afternoon, some basic tools, a mug of tea and the garage door opener is up and operational. 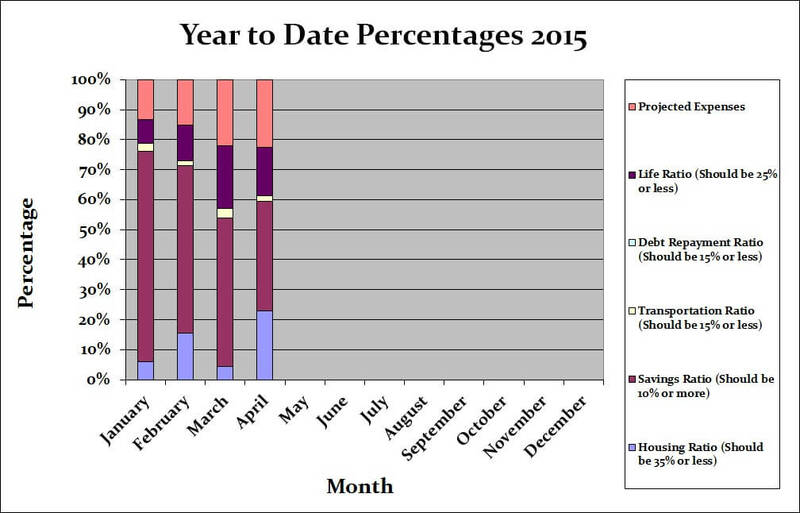 Although this month was quiet, the forth coming month will not be. I’ve already started on the garden but there will be many purchases to come in May. Our savings of 36.54% includes savings and investments and emergency savings for this month. The other categories were well within the defined percentage limits. 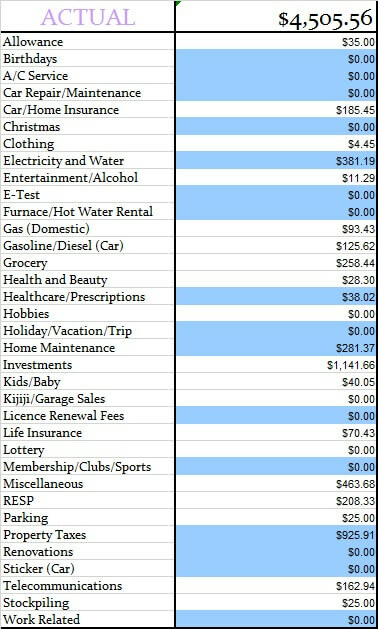 Our projected expenses this month is at 22.60%. Below you will see two tables, one is our monthly budget and the other is our actual budget for the month of April 2015. Find Flights to the UK and a Hot Getaway- I’ve located some flights but now we are looking at times and when I can fit a few weeks off from work into the mix. Reach 6612 Facebook Followers- Looks like I took a bit of a nose dive when FB went in and cleared out the fake accounts like they did on my pages. Reach 3060 Followers The Free Recipe Depot Facebook- FAIL but close. Reach 170 Followers Bloglovin- FAIL lost 1 …. come back fan, come back!! Ha! 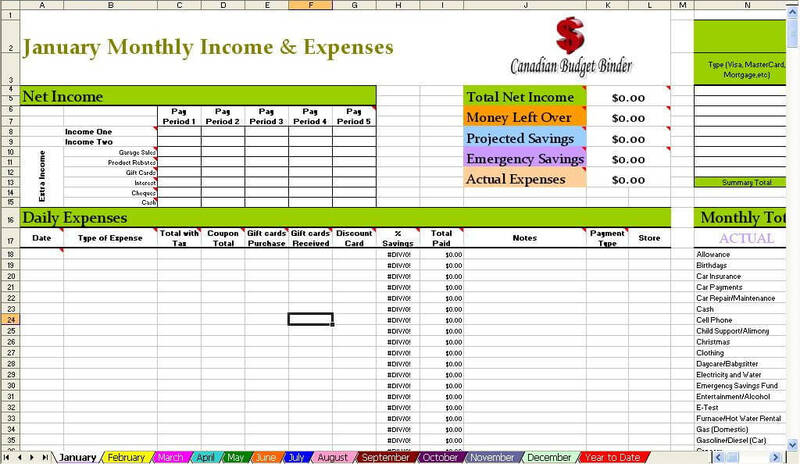 Finish the budget projected expenses- FAIL but now that I have a bit of time from work I can start looking at it again. Pick out new tiles for bathroom and accessories (mirror, towel bar holder etc. ) I haven’t had a chance to do this yet but I will soon. Buy a new blind for the garage- Nope, not done yet. Finish the walls in the baby room- Haven’t even had time to think about it. Hire a house cleaner/Babysitter- We’ve interviewed and considered it but are not 100% committed to the idea as of yet. Purchase a new garage door opener- Done, Done and Installed. Bring the plants out if the weather is warm enough- I’ve watered them all and will take them out as soon as I finish the deck maintenance. Stain the deck- I’m going to buy a sander instead of rent and sand the entire deck so I can stain it again. Research and get quotes for a new fence and gulp… talk to the neighbours about pitching in some cash- I haven’t done any of this yet. Spring cleaning around the house- We’ve been doing odds around the house. If anything it was mostly to get rid of any dust. 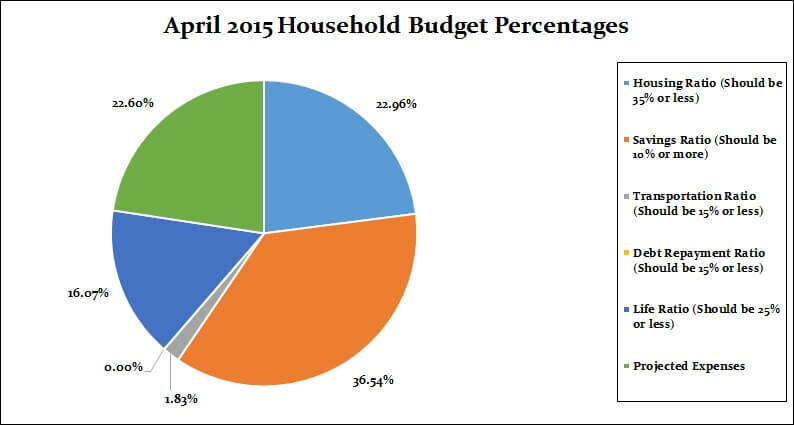 That’s all for this month check back at the beginning of May 2015 to see how we made out with our April 2015 budget! Mr CBB, you are one of the bloggers who are so organized and stick to having to-do-lists. I actually notice this based on your posts, which are more on lists for budget, tasks, expenditures, and savings. Me, I also do have a to-do-list but not as detailed as yours, but I think it’s a good start. Once I have the skill, I think I will end up having a detailed list like yours, which I plan to have. Be careful they can get out of hand and VERY LONG… lol. It’s worth it for me at least. I have to admit I tend to have short term memory issues when I have items or chores to do during a busy day so I have to write them down on the back of my left hand. Its a list but more than that it is right in front of my face to remind me. I have made lists before on paper and placed in my pocket where I forgot about the list. If I have a long list of purchases it does work to write LIST on my hand and then I will check my pocket for it. Sad but true. I tend to have a running list going for the things that need doing here. Feels good to cross things off as they get done! The list goes into overdrive if there is something up coming like a trip or a holiday. I’ve used those old steno notebooks from the dollar store, one page, both sides for the weeks list. Usually with the day written beside the job for what day I plan to do it. My daughter has used those day planners for years. Made for an easy idea for a Christmas gift, just get her a nice one for the new year. She would use one that had a page for each day to have room to write everything down. I’d go nuts if I had to remember all the things to get done some weeks without a list!! Hubby will fuss about me locking doors here. I guess they never did when he was a kid but we did at my home! With him working nights, the doors would be locked even if I was home, especially if I was by myself. Those times there would not be a vehicle in the drive so you couldn’t tell if anyone was home unless you looked in the right window. He’d come home from work and complain because the door was locked…..
We have always had cats here that would be left behind if we went anywhere. I had no problem asking someone to come in to feed the furballs as I figured it meant I had some one come in and check the house while we were gone. The insurance company would be happy there. Things are looking good at your place!! That’s just it. “It feels good crossing things off” and I also don’t have to worry about storing it all in my head. My parents always locked the doors and there’s no way in hell I’d leave our doors open in the GTA…. people are always coming by to sell something or another. Our neighbour gives us the key to their home and we go feed their cats when they jet off every year. I don’t mind they are a nice couple. The house has lots for me to do Christine. I will take as many pictures as I can. The fig is coming up now but I need to get the deck sanded and stained so I can move all our plants out of the sunroom on to the deck. I have to get all the furniture for the deck and sunroom up too.. so much to do.